SAN FRANCISCO -- All-Star Stephen Curry sizzled for 47 points on 16 of 29 shooting from the filed including 7-for-14 from 3-point range. 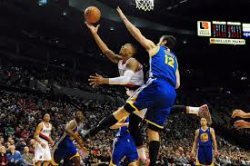 But it wasn't enough as the Golden State Warriors fell to the Portland Trail Blazers in overtime, 119-117, Sunday night at the Moda Center. LaMarcus Aldridge had 26 for Portland and Wes Matthews added 24. The Blzers clinched the 5th seed in the Western Conference with a 53-28 record and they are poised to meet the 4th-ranked 53-27 Houston Rockets in the opening round of the playoffs which kicks off on April 19. "That was a fun game, a crazy game. We'd make a shot, they'd come back right at us, craziest game of the year," Blazers small forward Nicolas Batum told NBA.com after scoring 18 and 12 rebounds to help foil Golden State. Photo: Blazers guard Damian Lillard tries a circus shot against 7-foot- Andrew Bogut in the Blazers' overtime win over the Warriors Sunday night.